Tempted to use their first pick Sunday on him but opting instead to take Washington tight end Will Dissly, the Seahawks had to wait out some nerve-wracking moments to pair Shaquem with twin brother Shaquill. More than anyone else involved in the story, Pete Carroll and John Schneider had the ability to at least get somewhat prepared for the enormity of what was to come. 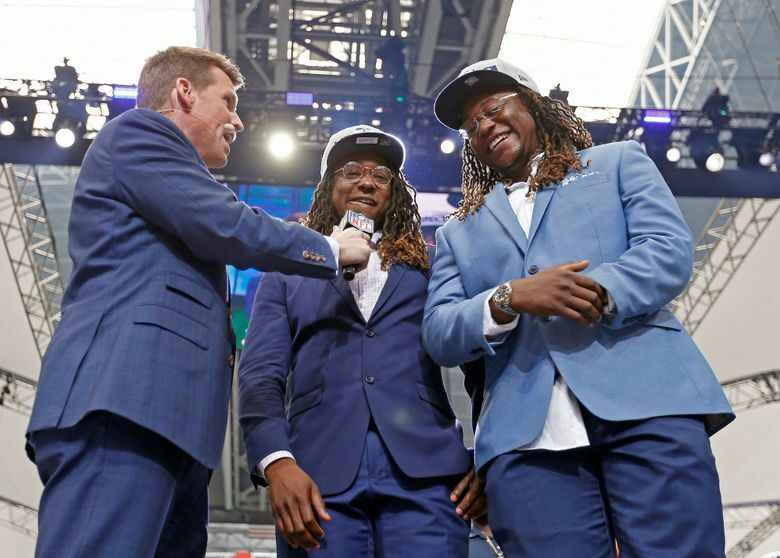 But when the time arrived to make the call to Shaquem Griffin to let him know he was now an official member of the Seattle Seahawks — fulfilling a lifelong dream to join twin Shaquill in the NFL while putting an almost too-good-to-be-true capper to his own story of perseverance — it all caught up to Seattle’s coach and its general manager. It was a call that created the feel-good story of not just the Seahawks’ draft but that of the entire NFL. The image of Shaquem, who overcame losing his left hand to amputation at age four after being born with amniotic band syndrome, bursting into tears upon getting the call at a Dallas-area hotel room after sitting in the green room at the draft for two days without being taken, will linger as long as the draft is held. But Carroll and Schneider insisted that the team didn’t draft Shaquem Griffin for the story, or because there was no more popular choice among the team’s fan base that they could have made. And Carroll and Schneider said the choice of Shaquem made all the sense in the world for them for football reasons alone. At just over 6-foot and 227 pounds, Griffin ran a 4.38 40 at the NFL Combine, the fastest of any linebacker there. And the more they studied the film of his play at Central Florida, the Seahawks also noticed that Griffin seemed to have knack for rising to the occasion. “He makes his plays at critical points in the game,’’ Schneider said. Along the way, the Seahawks had no choice but to assess how the lack of his hand might impact his play in the NFL. The Seahawks plan to start out Griffin at weakside linebacker, the spot K.J. Wright has manned exclusively since 2014. So with the decision that they wanted to draft Shaquem Griffin having been made, the Seahawks had to sit and wait. While they knew they wanted him, they also had other needs, and had placed a value of where they expected Griffin to get taken. And while they might have been tempted to tab Griffin with their first pick Saturday, number 120 in the fourth round, they instead used that one to select tight end Will Dissly of the University of Washington. The Seahawks concluded that he was the best blocking tight end in the draft with the potential to make the kind of impact Zach Miller did on the 2013 Super Bowl title team. With Dissly in the fold, Seattle then had to wait out 20 picks to get a chance at Griffin. “Was pretty nerve-wracking,’’ Schneider said. But then the moment came and nerves turned to chills. Then the Seahawks got back to business of completing a nine-man draft class that features its share of other feel-good stories and one that has ominous overtones for one of team’s most popular players — punter Jon Ryan, who has been with Seattle since 2008 and is the only player left who predates the arrival of Carroll and Schneider in 2010. In the only trade the Seahawks made Saturday, Seattle gave a seventh-round (248) pick to Denver to move up from 156 to 149 and take punter Michael Dickson of Texas, the Ray Guy Award winner in 2017. NFL teams don’t keep two punters during the regular season, so the obvious conclusion is that the 36-year-old Ryan could soon be on his way out. Ryan has two years remaining on his contract and Seattle could save $5 million against the salary cap in those two years by releasing him. Carroll and Schneider, though, said that for now, Ryan will remain on the roster and compete with Dickson. “He was just too unique of a player to pass up,’’ said Schneider of Dickson, who was the seventh punter drafted by Seattle in team history and first since Ryan Plackemeier in the seventh round in 2008. In fact, the Seahawks were so enamored by Dickson that they had him in for one of the team’s 60 official visits during the Combine. There, Seattle memorably asked Dickson to engage in a staring contest, challenging him on how long he could keep his eyes open without blinking. Dickson said it took him three times before he finally was able to keep his eyes open for any length of time. What mattered more was that Dickson — a native of Sydney, Australia who has background in both rugby and Australian Rules Football — averaged over 47 yards per kick last season and had an uncanny ability to down punts inside the 10- and 20-yard lines, having been named the MVP of the Texas Bowl when he downed 10 of 11 attempts inside the 20. “He was the best player on the field (in that game) by far,’’ Schneider said. Seattle also drafted cornerback Tre Flowers of Oklahoma State and left tackle Jamarco Jones of Ohio State in the fifth round, edge rusher Jacob Martin of Temple in the sixth round and quarterback Alex McGough of Florida International in the seventh — the first quarterback the Seahawks have drafted since taking Russell Wilson in 2012. All were part of a well-rounded draft class that featured four offensive players, four defensive players a punter and one indelible moment.